In a world of instant gratification and short attention spans, attracting eyeballs poses a huge challenge for trade-fair participating exhibitors. 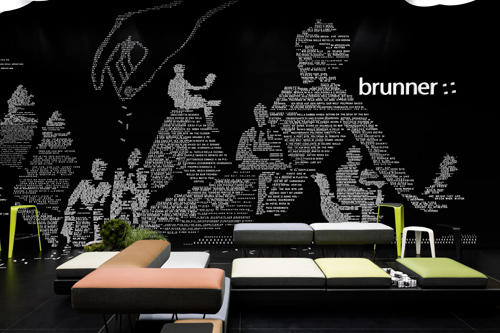 So, furniture company Brunner and paper and printing company Janoschka commissioned design studio Ippolito Fleitz Group the task of grabbing visitors’ attention through stand-alone exhibition design ideas. 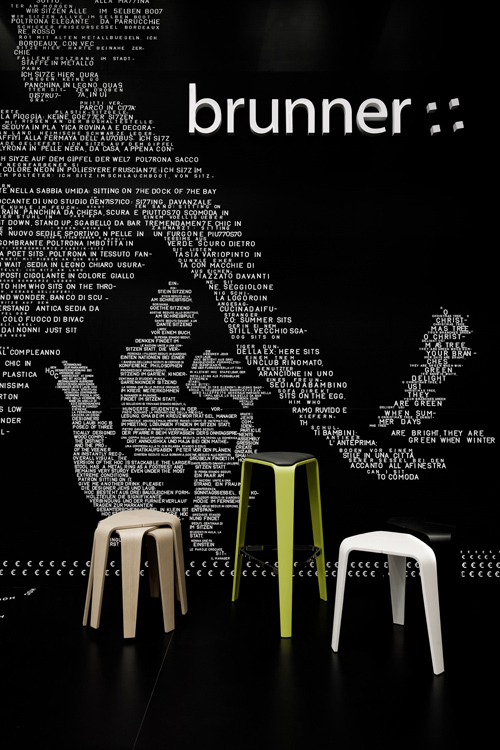 Principal architects Peter Ippolito and Gunter Fleitz known for their thorough research, meticulous analysis and unique ideas were chosen to deliver their trademark out-of-the-box solutions. 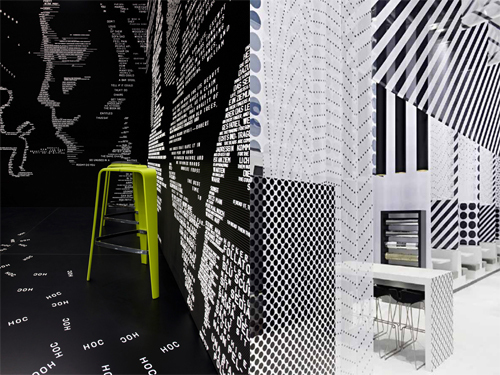 Using a strictly black and white backdrop to highlight Brunner’s two colourful new products – the ‘hoc’ stool and ‘plot’ modular seating system, Ippolito Fleitz Group created an installation-simulation, which had the rectangular stall covered wall-to-wall with 54,000 plastic letters, reminiscent of good ol’ information boards once seen ubiquitously in hotel lobbies, bars, airports, etc. 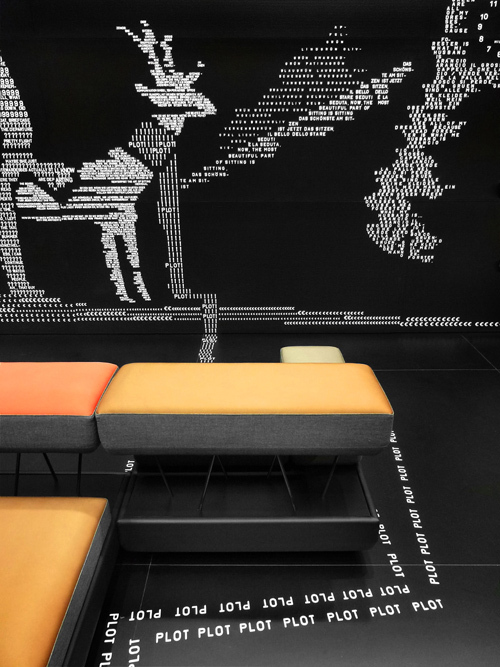 The white plastic letters inserted into the black framework conjure up images, figurines related to information on the products on display and generally on the theme of sitting, a stream of words spilling over onto the floor. 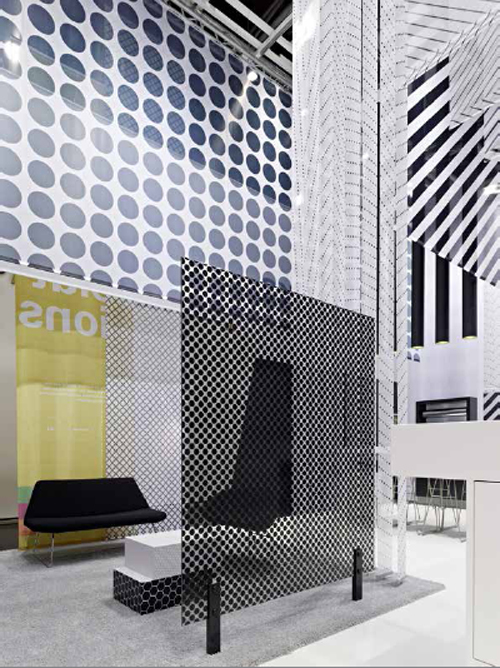 A brightly illuminated, cloudy sky of contoured textile fins suspended above, conjures up an ‘Alice in Wonderland’ feeling, thus taking the experience of testing a new product at an exhibition to a completely new level. 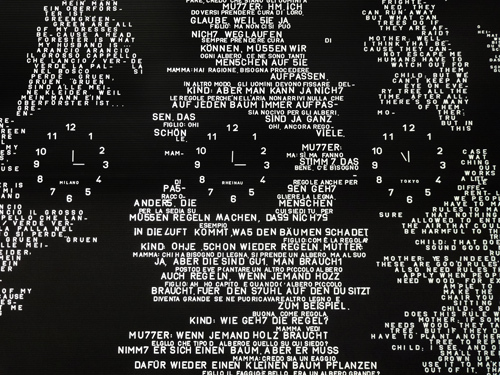 This background of textual vocabulary succeeds in taking visitors on a poetic voyage of discovery and inspiring them to get intrigued and assimilate. 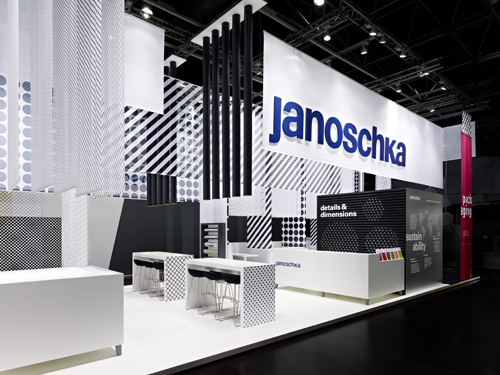 Interestingly, with Janoschka, special exhibits and communication areas simplified the company’s abstract processes into fun and easily digestible concepts for visitors to grasp. 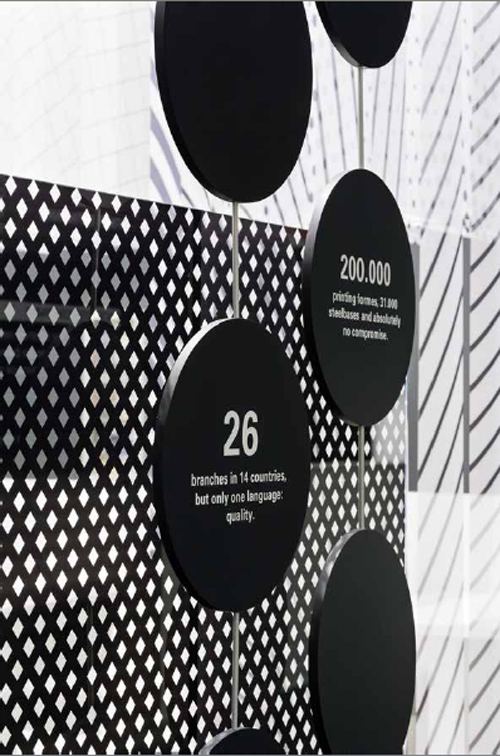 Overall, the stand design features a black and white palette coupled with a play on extreme leaps in scale, using visuals and communication derived from the world of printing plate production and reproduction – the very essence that needs to be conveyed. 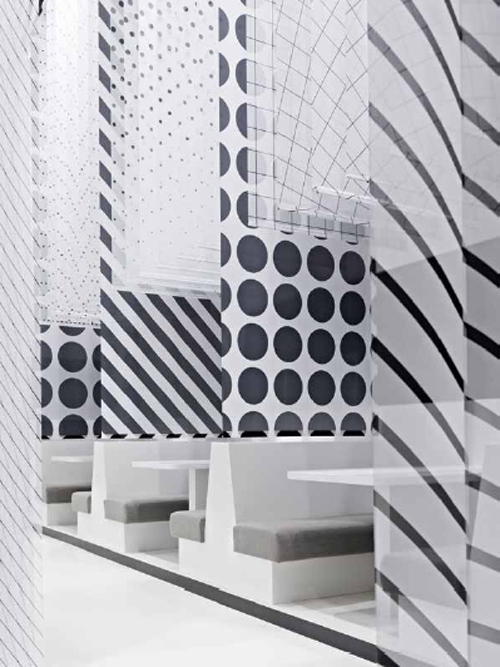 Though everything is designed in B&W right from the walls to tables and the chairs to racks, the use of dots, stripes, circles and squares ensure a captivating slate, intriguing enough to leave a trade fair visitor gaping in wonderment and yearning to learn more. Result: another winning idea!